Platform Arts last week launched the first in an ongoing series of exhibitions, installations and happenings in the former children's hospital and RUC Barracks on Queen Street, Belfast, to continue over the next two years. ‘Station’ is an experimental curatorial project organised by Platform Arts. It will commence in 2010 and run for two years. The premise of the project is to invite artists, writers, and curators etc to come and make work in or in response to the building. The building itself is located on Queen Street, Belfast. It was built in 1878 as a children’s hospital, rumoured to be one of the first hospitals to be set up under Florence Nightingale’s model of nursing and run by her matrons. It was then turned into an RUC barracks from 1933 to 2000 when it was officially close down and sold. It was one of the oldest RUC barracks in the city and suffered a catalogue of attacks during the ‘Troubles’. 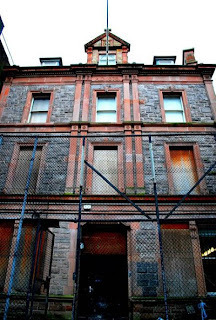 It is a Grade One listed building and it is due to be renovated in 2013 and turned into a hotel and bar. We have been granted access to this building for the next two years, where we hope artists will come and make work in the space or in response to it, leaving a trace of their activity behind thus creating a new layer of history to the building. All work will be documented and archived with the hope that the collection will go on to exhibition when the project comes to an end. QUB ARCSOC lecture - tonight! "What's wrong with this place?"